In this review of the Sky Bet app, we show you how to download the mobile app, claim the free bets plus take a tour of what’s on offer. This betting app is BSkyB’s answer to sports betting and casino on the move or on the home computer and it’s clear that much thought has go ne into the app’s design. It’s a responsive app that detects which device that you are using so there’s no need to be concerned over whether you’re an iPhone, Android, BlackBerry or tablet user. The Sky Bet app majors in sports betting and gives new customers a great deal with a £20 in free bets. And there’s more where that came from. For starters, make certain of claiming the intro free bet which is as mentioned is a £20 free bet. Read the quick guide below to get signed up first. Once done (registering only takes a minute or so) you’ll qualify for claiming the free bet. First, secure the free bets by going to the Sky Bet registration page. Press “Join Now” and complete your details. 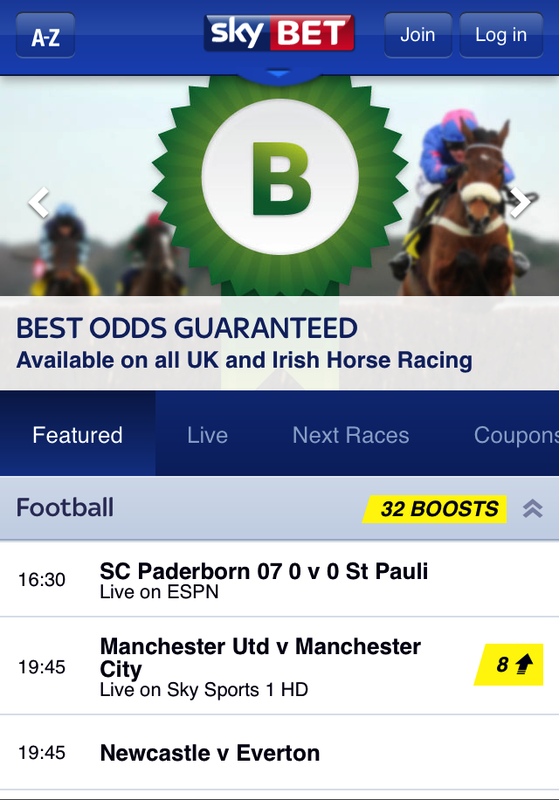 *Update* Since the advent of the BookieBoost app, we recommend installing it for Androids and iPhones/iPads. 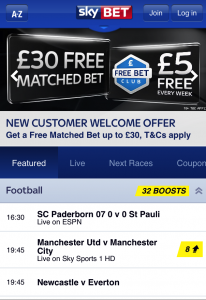 BookieBoost centralises your betting in a single app, giving you access to Sky Bet as well as the introductory offers and specials f rom more bookmakers. BookieBoost also gives users live score updates, plus extras like betting calculators for football and horse racing so it’s well worth having on your smart phone. We also like that BookieBoost de-clutters your home screen by keeping all your betting needs in one place. If you’ve followed the steps as outlined above including accessing the Sky Bet Mobile app via the BookieBoost icon on your home screen, you’re now good to go. There is nothing more that you need to to get using the app but you do also have the option of installing an installed app on certain mobile devices. However, the way shown above avoids using extra space on your mobile device and ensures that you don’t have any app crashes happen. This is a mobile site and detects the make and model of your mobile device, serving up the correct viewing experience for your particular mobile. It also works on normal home computers too. Taking more of an in-depth look around this app, it really is a nice looking mobile app and it is clear that the people who developed it though long and hard about the user experience. There are fantastic sports areas, particularly football and horse racing, and the casino & games have been designed for ease of use. Then of course is the important matter of the free bets for all new customers. You’ll no doubt be as keen as our review team to find out how to spend the £30 introductory bet and we are pleased to report that it’s a piece of cake. Every new customer to the Sky Bet is able to get (at time of review) to a free bet up to a value of £30. It’s just a straightforward matched bet. Centre-top on the screen is a main menu that drops down to show you the main areas of the app itself. When this has been expanded, you will notice the main links to football and horse racing as well as the Free Bet Club and Bet to View. There is also a useful A-Z list of everything else that they run betting markets on. The racing section features streaming video of live races which we’re seeing on a lot of apps. It’s worth checking out the wide range of betting options for football which must include just about every league and competition known to mankind. Try your luck with accumulators which are easy to put together to gain much greater odds with combined bets. With the in-play odds continually being quoted during events it takes the stress out of placing a bet just a few seconds after it has begun. Had a flashback there to the bad old days when picking the winner but not getting to the front of the queue in time! You will likely see ‘Price Boost’ here and there on the Sky Bet app and this means that you can get enhanced odds that you’ll probably not find anywhere else. This is for selected events and is a promotional initiative which you should keep an eye out for. 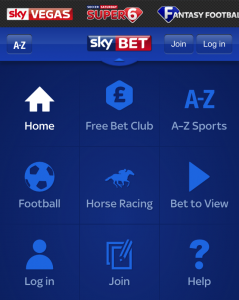 What is the Free Bet Club on the SkyBet App all about? Once you’ve used the introductory free bet, that’s not the end of it on the Sky Bet app. Another innovation that Sky Bet have which is different from the rest is a way to keep the free bets coming and they call it the Free Bet Club. Under the terms of the Free Bet Club, you can qualify every for a free bet by placing a £5 accumulator with combined odds of 5/1 or more before midnight Sunday. A free bet will then be credited by 7pm on Monday for using on any sport that you choose. Here’s the catch – If you miss a week you’re out of the Free Bet Club!! Like all good clubs though there’s a way to get back in. The way to do this is to place a new £25 accumulator. In addition to the Free Bet Club, Price Boost and their Best Odds Guarantee for UK and Ireland horse races, the Sky Bet also has a free £10 bet bonus for the casino games. This can be used for on ‘Sky Vegas’ which is available to all customers at any time upon first play. Sky Vegas is another virtual roped off area where you can indulge in casino games. Bet you never guessed that. Anyhow, after using it and using up the £10 free bet, at the time of this review you can have a 200% first deposit bonus up to £1000 and a free Sky Vegas Millions ticket on top of it. Offers are subject to change but there always seems to be something appealing going on across the Sky Bet app and Sky Bet web site. That concludes our comprehensive analysis of the Sky Bet app. You might also wish to check out the rest of the best mobile betting app shortlist contenders. Visiting from Canada? Here’s a country specific list from Mobile Betting Apps (external site). Also on this site, see our Sky Bet mobile reviews for Android, iPhone, iPad and Blackberry devices.